Professor Justin Read, lead author of the study and Head of the Department of Physics at the University of Surrey, said: "We found a truly remarkable relationship between the amount of dark matter at the centres of these tiny dwarfs, and the amount of star formation they have experienced over their lives. The dark matter at the centres of the star-forming dwarfs appears to have been ‘heated up’ and pushed out." Professor Matthew Walker, a co-author from Carnegie Mellon University, added: "This study may be the “smoking gun” evidence that takes us a step closer to understanding what dark matter is. Our finding that it can be heated up and moved around helps to motivate searches for a dark matter particle." A copy of the paper is available from: https://doi.org/10.1093/mnras/sty3404. Star formation in tiny dwarf galaxies can slowly "heat up" the dark matter, pushing it outwards. 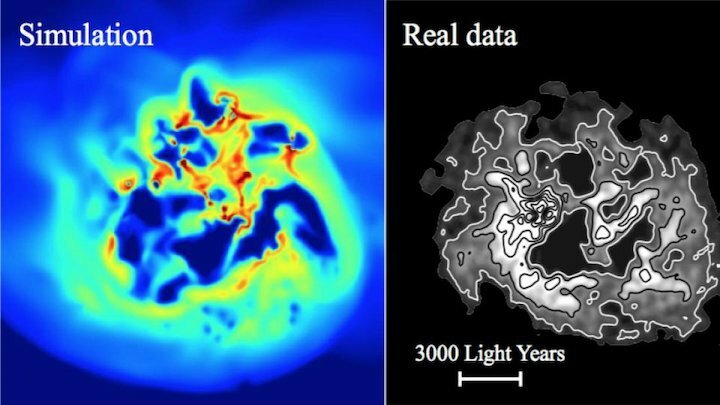 The left image shows the hydrogen gas density of a simulated dwarf galaxy, viewed from above. The right image shows the same for a real dwarf galaxy, IC 1613. In the simulation, repeated gas inflow and outflow causes the gravitational field strength at the centre of the dwarf to fluctuate. The dark matter responds to this by migrating out from the centre of the galaxy, an effect known as ‘dark matter heating’. The new work appears in: “Dark matter heats up in dwarf galaxies”, J.I. Read, M.G. Walker, P. Steger, Monthly Notices of the Royal Astronomical Society (2019), in press (DOI: 10.1093/mnras/sty3404).